So Radiant Orchid was the color of 2014 and rightly so. It has just the right amount of warmth and mystery to it and an equally strong personality. It exudes a lot of confidence and reflects extremely well on the skin. An outright winner I would say! This list will tell you what colours are 'in' and how to use them so you can look your best this Diwali. 1. Juicy Orange, specifically the ‘spiritual orange’ as I call it, or marigold orange is the color to wear this season. It is the color of flowers used during prayers and its also the color of saffron which is used in a lot of sacred rituals and ceremonies. The colour Orange, again has an unbeatable character and a strong personality and sets the wearer apart from the crowd. So if you want to draw attention towards yourself and be seen as standing different from the crowd, Orange is the colour for you. Just in case you find orange too overwhelming, break it with the right accent like Purple-Wine. It's a contemporary color and works wonderfully well as an accent. 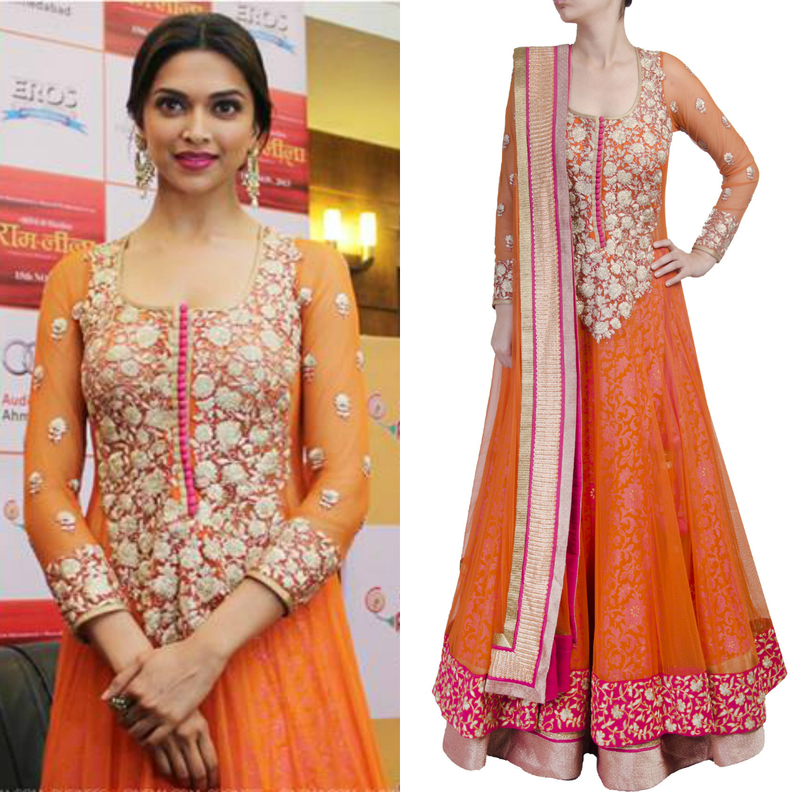 STYLE TIP: If you wear an orange kurta-churdiar, you can have wine color border added to your dupatta. Alternatively, you can also add purple-wine coloured tassels to the back neckline of your kurta. The colour, Purple-Wine stands for sophistication and elegance and by using it in accents, you can add so much style to your outfit. 2. 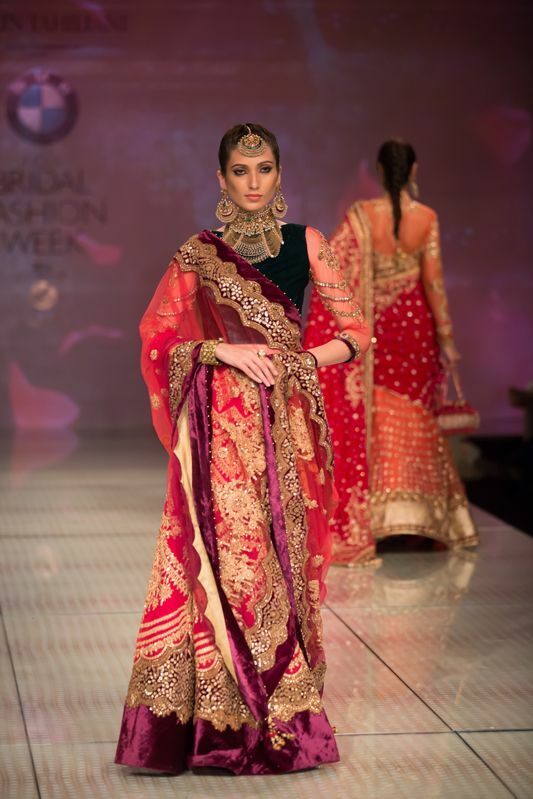 Reds have always been an integral part of the Indian tradition. Whether its wedding or a festival or any kind of celebration for that matter, Indians just love the color Red. But this season, its time for bright red more commonly known as 'blood red'. STYLE TIP: Wear an anarkali suit or a long skirt with short choli this Diwali, but you must remember to use red innovatively. Combine different fabrics with tints and shades of blood red in the same outfit to make it more interesting. 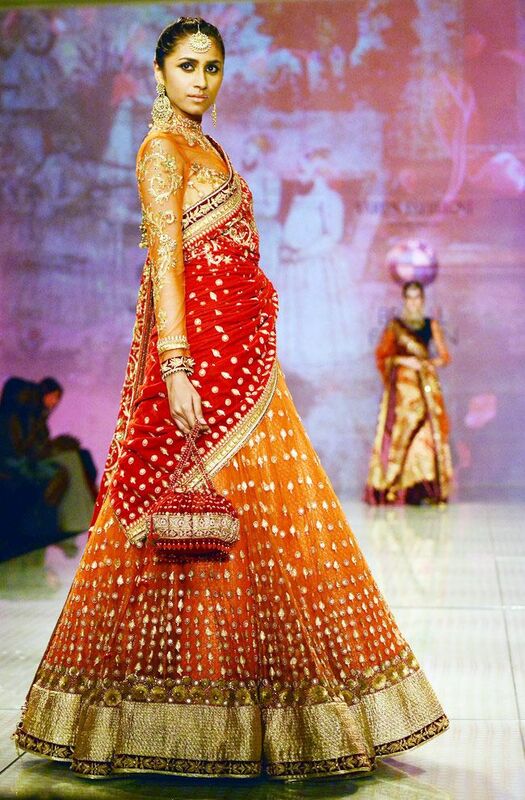 You can team your blood red silk skirt with a dark red velvet choli and have a light red sheer dupatta. 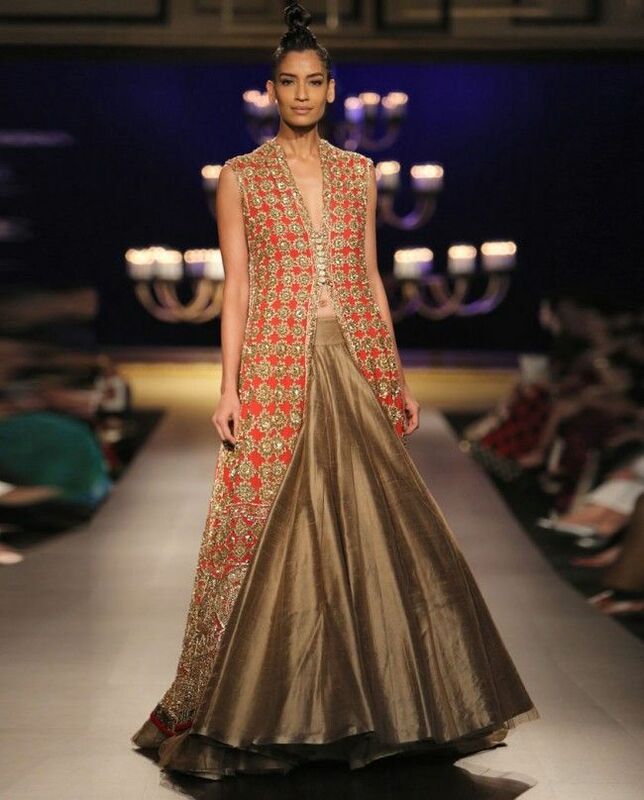 Add a velvet border to your dupatta to balance the ensemble. 3. One more color that designers have used this season extensively in their collections is 'turmeric yellow'. The turmeric yellow color is a warm color and that is why it also helps in adding warmth to the skin thus making your skin glow. Its an extremely versatile colour and can be used equally well for day as well as in the night. This tone is just the right combination of yellow and orange so it has the cheerfulness and positivity of yellow as well as optimistic and uplifting characteristics of orange. STYLE TIP: When wearing turmeric yellow, go low on jewellery/accessories. Turmeric-yellow is a strong and self-sufficient colour and therefore needs minimal embellishment. 4. Gold is the epitome of richness and glamour and hence can never be ruled out whatever Indian culture you may belong to. Its not a color but a classic metallic shade and is in trend every year and every season. However, this is one tricky shade and needs to be used very cautiously. The trick here is to use gold as embellishment and not as a colour in itself. Although the rules vary from situation to situation. So if you're looking at wearing gold clothes, its perfectly okay. But its very important to break it with a pop of colour. STYLE TIP: If you're wearing a predominantly gold lehenga for this Diwali, break it with a colored detailing or a bright colored dupatta. You can also off-set your gold outfit with bright jewellery. Another way is to opt for 'palge gold' instead of 'bright gold'. 'Minimalism' is the word these days and gold is anything but minimal. So if you want to go by the latest trends, wear gold during weddings and festivals like Diwali but use it with discretion. 1. Orange and Pink: This fun combo has been there from the beginning of this year. Celebrities have worn it and magazines have covered it. High time you tried it too, lest it goes out of fashion. And you know how fickle fashion is. 2. Pink and Wine: These two colors belong to the same color family, so they work as compliments. That means, they enhance each other and make for a very soothing color combination. You can add a hint of black to this combo, to offset it. 3. Yellow and Red: They both are equally strong colors and make for a lethal combination. They should be used in proportions of 80-yellow and 20-red. These are the trendiest festive colours and combinations of 2014. Pick up the ones that you like and experiment with fabrics and silhouettes but dont forget to work out your own combinations and create your very own personal style.